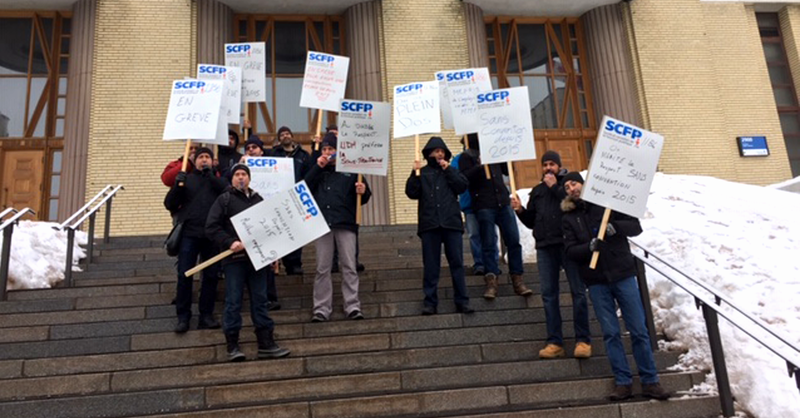 The strike by building systems technicians and stationary engineers is continuing at the Université de Montréal. Yesterday, the strikers voted unanimously in favour of continuing the strike, which began last March 14, for an additional fifteen days. The situation has worsened since the union recently discovered that the Université de Montréal may have turned to hiring scabs, which is prohibited by the Labour Code. A Ministry of Labour investigator is currently reviewing the case, and his report is much awaited. The union indicated that university representatives were late in providing documents requested by the union and has noted that the employer is attempting to instill a climate of fear. “On March 23, a member of the union executive was suspended as part of an investigation, a move believed to be in response to the discovery of strike breakers. Moreover, the local president and the union secretary were summoned to a meeting as part of the investigation. These tactics by the employer harken back to another time,” said CUPE union representative Liette Garceau. The 18 specialized workers have been without a collective agreement since April 2015. The main stumbling blocks are contracting out, the length of the collective agreement and the banking of overtime. The presence of a conciliator had little effect given the university’s unwillingness to negotiate. “It takes two to tango, and as it stands now, the union is the only party intent on bargaining in good faith,” said Sylvain Chicoine, president of CUPE 1186.